For the town, see Panhandle, Texas. For the western panhandle-like area of Texas, see Trans-Pecos. 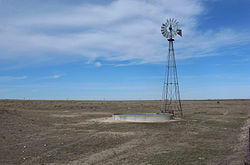 The Texas Panhandle is a region of the U.S. state of Texas consisting of the northernmost 26 counties in the state. The panhandle is a rectangular area bordered by New Mexico to the west and Oklahoma to the north and east. The Handbook of Texas defines the southern border of Swisher County as the southern boundary of the Texas Panhandle region. Its land area is 25,823.89 sq mi (66,883.58 km2), or nearly 10% of the state's total. The Texas Panhandle is slightly larger in size than the US state of West Virginia. An additional 62.75 sq mi (162.53 km2) are covered by water. Its population as of the 2010 census was 427,927 residents, or 1.7% of the state's total population. As of the 2010 census, the population density for the region was 16.6 per square mile (6.4/km2). However, more than 72% of the Panhandle's residents live in the Amarillo Metropolitan Area, which is the largest and fastest-growing urban area in the region. The Panhandle is distinct from North Texas, which is farther southeast. West of the Caprock Escarpment and north and south of the Canadian River breaks, the surface of the Llano Estacado is rather flat. South of the city of Amarillo, the level terrain gives way to Palo Duro Canyon, the second-largest canyon in the United States. This colorful canyon was carved by the Prairie Dog Town Fork Red River. North of Amarillo lies Lake Meredith, a reservoir created by Sanford Dam on the Canadian River. The lake, along with the Ogallala Aquifer, provides drinking water and irrigation for this moderately dry area of the High Plains. Interstate Highway 40 passes through the Panhandle, and also passes through Amarillo. The freeway passes through Deaf Smith, Oldham, Potter, Carson, Gray, Donley, and Wheeler Counties. The Texas Panhandle has been identified in the early 21st century as one of the fastest-growing windpower-producing regions in the nation because of its strong, steady winds. Before the rise of Amarillo, the three original towns of the Panhandle were Clarendon in Donley County, Mobeetie in Wheeler County, and Tascosa in Oldham County. Clarendon moved itself after it was overlooked by the Fort Worth and Denver Railroad. Mobeetie was reduced even below its original small size with the closure of the United States Army's Fort Elliott in 1890. Tascosa was ruined by the location of the railroad too far north of the town and the inability to build a feeder line. The Tascosa Pioneer wrote in 1890: "Truly this is a world which has no regard for the established order of things but knocks them sky west and crooked, and lo, the upstart hath the land and its fatness." Caprock Canyons of Briscoe County. As of the census of 2000, about 402,862 people lived in the Panhandle. Of these, 68.9% were non-Hispanic White, 23.8% were Hispanic, and 4.6% were African American. Only 2.7% were of some other ethnicity. About 92.3% of inhabitants claimed native birth, and 8.9% were veterans of the United States armed forces; 49.9% of the population was male, and 50.1% was female. Around 13.2% of the population was 65 years of age or older, whereas 27.8% of the population was under 18 years of age. Amarillo is the largest city in the Texas Panhandle. Panhandle-Plains Historical Museum in Canyon, Texas. The Dallam County Courthouse in Dalhart, Texas. Much like the rest of West Texas and the Oklahoma Panhandle, the region is very politically and socially conservative. Following the pattern of other larger cities, Amarillo has the largest liberal population in the Panhandle. It was one of the first regions of the state to break away from its Democratic roots, though Democrats continued to do well at the local level well into the 1980s. However, Republicans now dominate every level of government, holding nearly every elected post above the county level. Nearly all of the Panhandle is in Texas's 13th congressional district, represented by Republican Mac Thornberry. With a Cook Partisan Voting Index of R+33, it is the most Republican district in the nation. The counties of Castro and Parmer are in Texas's 19th congressional district, represented by Republican Jodey Arrington. In the 2016 Presidential election, Donald Trump received 79.9% of the vote in the 13th District, as compared with Hillary Clinton's 16.9% share of the vote. ^ "PANHANDLE". Texas State Historical Association. Retrieved 13 October 2014. Wikivoyage has a travel guide for Texas Panhandle.